Dimo HD Video Converter is a fully featured HD video converting software, providing users hassle-free HD video conversion solutions. 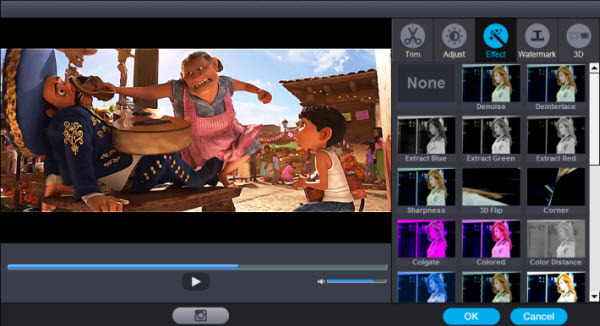 With it, you are able to download YouTube, DailyMotion and Facebook videos online, convert/downsize all HD videos (camcorder videos included) to iPhone, iPad, iPod, Apple TV, etc, create 3D/VR videos and make GIF. ISO Making limit: Users can make ISO from folder with only 3 times with the trial version. ※ Tips: you can upgrade to full version to remove limitations above. Also, the full version will constantly upgrade to latest version for free and provide technical support. Full Version Benefits: With full version of Dimo HD Video Converter, you will enjoy the complete benefits included. No converting limit: You can convert any HD video with no length limitation. Here is how you can upgrade to Dimo HD Video Converter full version. 1: Click "Buy Now" on the "Trial Version vs. Full Version" window to purchase the full license code. 1. Open Dimo HD Video Converter. Worked as an online video downloader, Dimo HD Video Converter can fast download online videos from 300+ sites like YouTube, Vimeo, BBC, Facebook, Google video, Myspace, etc. Open the "Download" tab, to import online videos, copy and paste video URL in the address box. Set output folder by clicking "...". Click "+" to add this video to the downloading queue. Batch video/audio downloading are also supported. Once finished, click "Open" to locate the downloaded videos for sharing on iPhone, iPad, Android, etc. wirelessly with free media server. Apart from downloading videos, this versatile, handy and swift HD video converter allows to convert HD videos to fit mobile devices, editors, online websites, game consoles, VR headsets, etc.. With hardware acceleration tech, it converts HD-camcorders videos in advanced 50x faster converting speed. Also, it keeps higher quality than common HD video converter and constantly free updates to support more new video formats/codecs. Click on "Add File" icon on the top bar of the software to pop out a drop-down box to browse and choose HD video for importing. Alternatively, you can directly drag and drop HD video files into the program. Also, you could play back loaded media files, take screenshot, edit loaded video files via the internal video editor, etc. After importing source files, open the right drop-down box from "Select Format" bar to enter the "Profile" panel, where you could select a proper profile as output format. This top HD video converter comes with diverse device presets for iPhone X/8/8 (Plus)/7 (Plus), iPad, iPod, Apple TV, Android, Samsung, HTC, Google Nexus, Amazon Kindle Fire, Surface, Xbox, FCP, iMovie, Sony TV, Gear VR, etc. You could select from "Format", "Device", "Editor", "4K Video", "TV", "Games" and "VR" groups or make use of the profile search bar to search desired profile quickly. 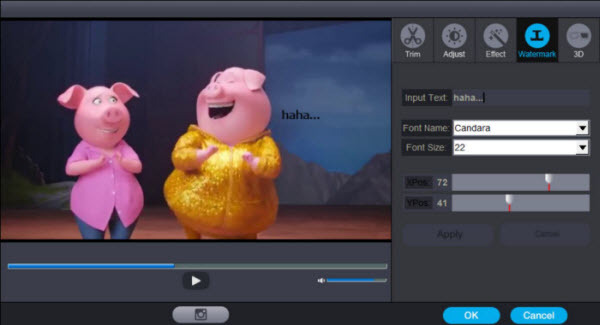 By clicking "Settings" button, you could enter the "Profile Settings" interface to adjust video and audio parameters of selected output profile, including: Video Codec, Quality, Video Size, Bit Rate, Frame Rate, Aspect Ratio as well as Audio Codec, Quality, Bit Rate, Sample Rate, Channels, etc. After setting completes, click "OK" button to save what you set..
After returning to the main interface, click on "..." to pop up a sidebar where you are required to set a directory for containing output video/audio files in the "Save to" box..
Click the "Start" button to start converting HD video files from one format to another. Batch conversion is available. After finishing conversion process, you can find all converted files from the output directory you set in Step 4. Launch Dimo HD Video Converter and click "Make ISO" to locate your source HD video folder. Click on the "Start" button to start the HD video folder to ISO converting process. It will take a few minutes to complete the process. Navigate to the "Converter" tab, click the "Add File" button to browse and load source HD video file into this video converter, or directly drag and drop source HD file into this program. You can click "Add File > Add multi-files or Add Folder" to add multiple media files, and all the imported files will be listed on the processing panel. Move mouse to the drop-down box right on the right to enter the "Profile" panel to select GIF from "Format > Video". You could even make use of the profile search bar to search "GIF" quickly. Tip 2: Click "Effect", you can apply some color effects like de-interace etc; And "Watermark" to input text you like to show. After setting output format, if you like, you could adjust video and audio parameters by clicking "Settings". 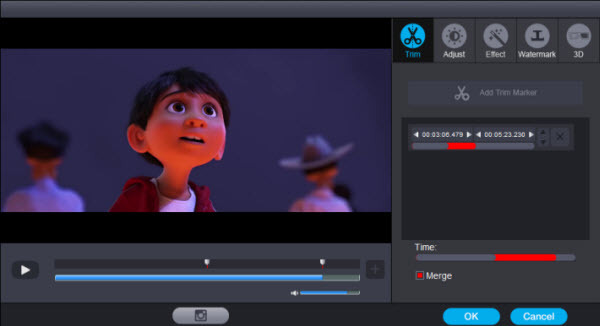 On the Profile Settings panel, you could set Video Codec, Quality, Video Size, Bit Rate, Frame Rate, Aspect Ratio, and Audio Codec, Audio Quality, Bit Rate, Sample Rate, Channels. After setting output profile, return to the main interface and then click "..." button to call out the output directory setting panel, where you need to set output directory in the "Save to" box. Click the "Start" button to start converting HD video to GIF within this GIF maker software. Download and install Dimo HD Video Converter. Then launch Dimo HD Video Converter by double clicking the installation file. When you launch the Dimo HD Video Converter, the "Converter" tab is already selected by default. However if any other tab is selected, you should switch to the "Converter" tab. Now, you can import the source video to Dimo HD Video Converter. You can load the video file by dragging it into the interface. Or you can click on "Add File" button and open the file explorer. Then you can select the desired video file from the explorer quickly. After you loaded the video into Dimo HD Video Converter, you can see the movie list on the interface. Move the mouse on the video file you want to play and double click it, a media player will pop up and you can play your video now. Step 1: Launch Dimo HD Video Converter. First install and launch Dimo HD Video Converter on your computer. Step 2: Import source file to the program. It is pretty easily to load files with Dimo HD Video Converter, you can directly drag and drop the files to the program or use the "Add File" button to load source file. 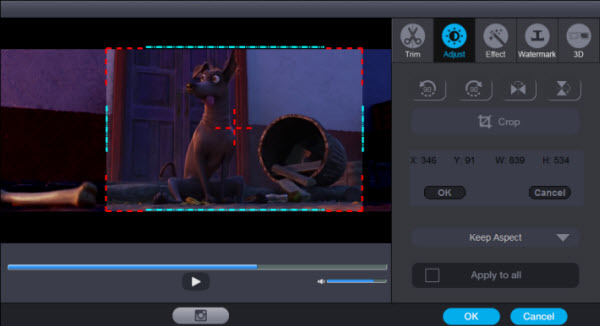 After importing source video file, click the "Edit" icon on the processing panel, and you will be guided into a real-time video previewing window where you can edit and customize video for output. Trim video to get desired parts. Under "Trim" section, you can directly drag the slide bar to trim video length, or manually input values in "Start Time" and "End Time" box. The clip length can be viewed instantly. Reset it or click "OK" to confirm it. If you need to trim multiple segments, choose another trim start time and end time, then use "Add Trim Marker" button again. You can modify the start time and the end time according. However if any point of time, you are not happy with the trimming, you can use the delete button and set the trimming start point again. If you like to put these trimming segments in right order, click "Up" or "Down" button to do adjustment. To add this multiple trimming segments into one file, check "Merge" option, otherwise you will get splitted trimming files. Under "Adjust" section, directly drag the dot frame to crop video, or select "Keep aspect", "Fullscreen", "16:9" or "4:3" to get your desired video size. The above four icon are used for flipping the video in various angles and rotate your source files. You can check to activate to adjusting Contrast, Saturation, Brightness, etc and directly drag the progress bar to get the effect you need. And you can preview the original and modified video in the preview area in real time. Press "OK" to confirm it. Check "Apply to all" to apply the settings to any of your loaded files. Go to "Effect" section to choose from 32 effect for special video effect. Press "OK" to confirm it. The "Deinterlacing" option allows you to convert 1080i HD files in MTS, MXF, etc. in interlaced format into a non-interlaced form. Switch to "Watermark" section to add a textual watermark. Just tap the text what you want to add into the video in the right place. Then click "Apply" and you can choose font size and and adjust the horizontal and vertical position of the text watermark. After all the settings, click "OK". 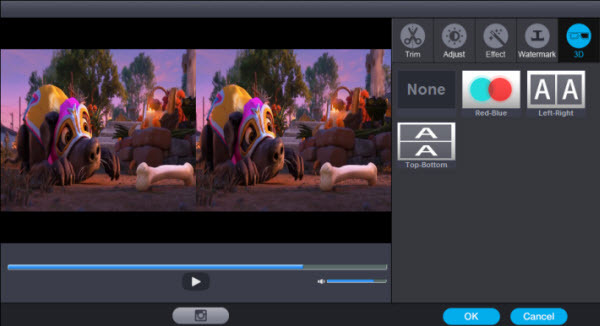 On the video editing panel, open the "3D" tab and then choose a 3D effect to apply to the final video file. There are in total 6 different 3D movie effects available for you to choose from: Red/Blue, Top-bottom, and Side by Side (Left-right). Select one according to the 3D glasses you are using to enjoy 3D videos and movies. Click on the "Start" button to start the HD video conversion process, it will take a few minutes (depending on file size) for the conversion to complete. Dimo HD Video Converter has a outstanding advantage. That is you can cast the converted video to your iPhone, iPad, Android Tablet/Phone, TV by the "Media Server" feature offered by Dimo HD Video Converter. The second step is to launch Dimo HD Video Converter. Click on "Media Server" icon at the top of the interface and choose the source HD video folder to locate by pressing "Browse...". Then hit "Share". 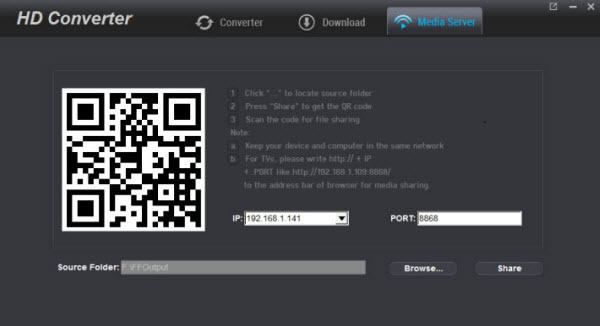 Your IP and Port will be detected automatically, and you will get a QR code. Use your iPhone, iPad, Android phone/tablet to scan the QR code then you can play the video directly without needing to transfer the media to devices via USB. For TV users, you even can write http://IP:PORT like "http://192.168.1.109:8868/" (without quotation marks) to the address bar of your browser for sharing your media files. The loaded video source will be listed and you can now play local files or converted movies on mobile devices or TV.